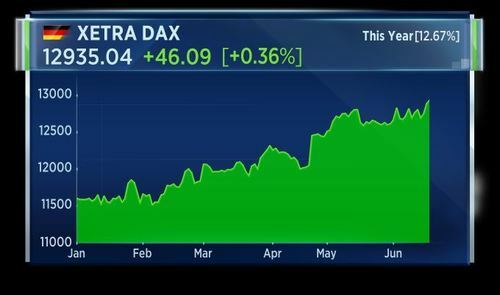 Tech is back on a tear as Apple helps the Nasdaq log its best day of the year, while the Nikkei rallies to near 2-year highs, driven higher by tech stocks. The CEO of Goldman Sachs, Lloyd Blankfein, tells CNBC he thinks the U.S. economy is in good shape, despite not being totally on board with President Trump's agenda. An early concession from Britain as Brexit negotiations kick off, with London agreeing to Brussels' demands on the sequencing of talks. Orange turns sour on BT, annoucing it could more than halve its stake in its British rival and raise over 1 billion dollars through the sale. 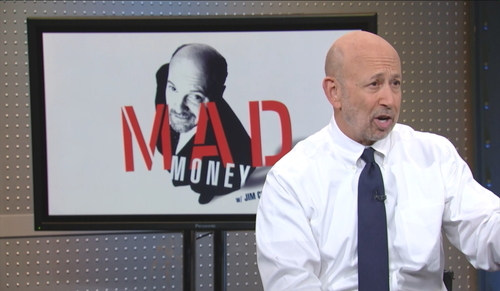 Goldman Sachs CEO Lloyd Blankfein has told CNBC he feels optimistic about the outlook for the US economy, citing employment numbers, low energy prices, and growth. I can't say I'm on all fours about the trump admin. Across the board but as far as the economy is going they represented stimulus in the form of lower taxs, spending on infrastructure, taking away layers and layers of regulation. That's certainly good for the market but generally I think good for the economy. Speaking about central bank policy, the Goldman Sachs CEO gave good marks to former Fed Chair Ben Bernanke and current chair Janet Yellen. If we end up suffering some inflation at the end of the day, which by the way there had been no signs of, which everybody was wringing their hands over, and still not enough of a sign. There's a playbook for dealing inflation. There is no playbook yet for dealing with deflation and they managed to avoid that by dealing by their kind of innovative policies that they were aggressive. And I say it took a lot of courage because all the naysayers were saying against them and were lined up against them. If it went wrong - if you look at it now, and everyone is worried about this, worried about this, but it hasn't gone wrong yet. 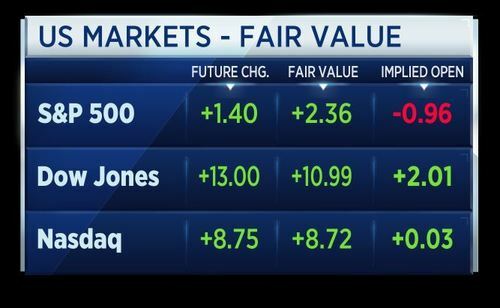 Let's take a look at what markets are up to this morning with CNBC's Karen Tso. Shares in Asia are mixed as investors await a decision on whether China's mainland stocks will be included in MSCI's benchmark emerging markets index. This is the fourth year the firm has considered including the shares. Think it comes back to control. 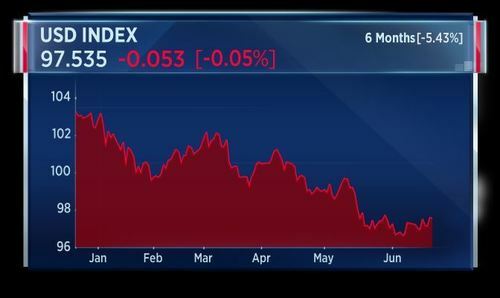 MSCI continue to have problems -- repatriations, veto power, suspended onshore...China needs to get tough domestically and at the same time free up to allow capital flows. And they seem unwilling to do so, and I think they're going backwards in some ways. Formal Brexit negotiations are now underway, nearly a year after the U.K. voted to leave the EU. Chief European negotiator Michel Barnier said the talks started on a good footing. He exchanged gifts with his counterpart, U.K. Brexit Secretary David Davis. 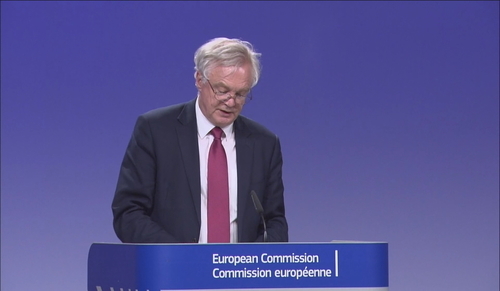 Barnier offered a walking stick and Davis gave a book about mountaineering. We also agreed on the importance of the timing for this first phase. Our objective is to agree on the main principles of the key challenges for the UK's withdrawal as soon as possible. This includes citizens' rights, the single financial settlement, and the question of borders in particular in Ireland. Orange turns sour on BT, announcing it could more than halve its stake in its British rival and raise over 1 billion dollars through the sale. 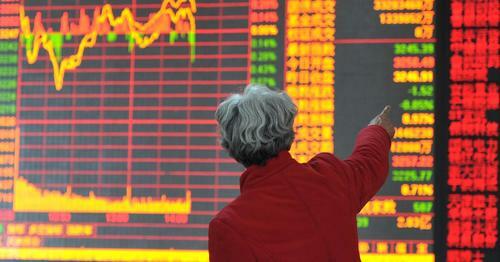 Today, MSCI, one of the world's largest index providers, will decide whether to include a selection of China's mainland stock market into its MSCI Indexes, which underpin some of the largest ETFs in the world, including the iShares MSCI Emerging Market ETF (EEM) and the MSCI ACWI Index ETF (ACWI). 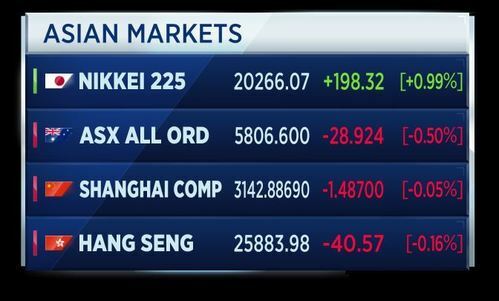 CNBCMSCI will decide on Tuesday whether to add the $6 trillion mainland China stock market to its indexes, including Emerging Markets. Japan's Nikkei rose more than 1 percent to a near two-year high on Tuesday, encouraged by rebound in U.S. hi-tech shares as investors bet on solid growth in the economy and corporate profits globally. MSCI's broadest index of Asia-Pacific shares outside Japan held firm near a two-year high struck last week, but was little changed on the day, with gains in high-tech firms offset by a decline in Australian shares. A big focus for Asia is whether index provider MSCI will later in the global day open up its Emerging Markets Index to Chinese mainland shares which have restricted access for foreign investors. Politicians are used to stinging criticism. It comes with the territory, but can still be hard to swallow. Not so for Costa Rica's president. Luis Guillermo Solis Rivera was speaking to the press when a wasp flew down his throat mid-sentence. Without breaking stride, the president laughed off the incident, saying the insect had merely added to his protein intake. 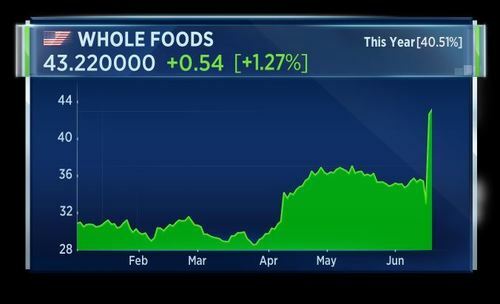 Whole Foods is looking to expand its product offering after it is acquired by tech giant Amazon. That's according to comments made by the retailer's CEO in a securities filing. The remarks suggest Whole Foods could be preparing to launch a whole new brand after Amazon completes its 13.7 billion dollar purchase of the firm. 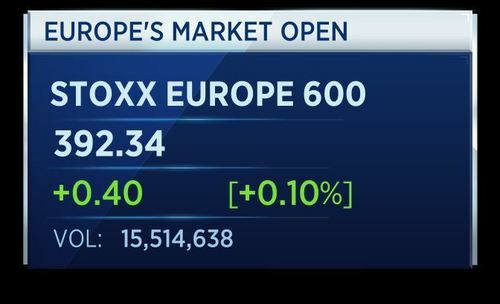 European bourses are expected to open higher Tuesday, as investors turn their attention to individual stock news and data, while keeping a close eye on political news coming out of the region. 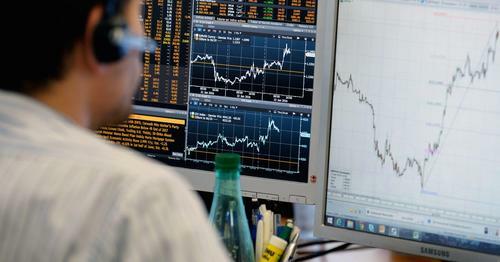 The London FTSE 100 index is called to open 10 points higher at 7,533, the German DAX up 33 points at 12,921 and the French CAC up 14 points at 5,324, according to IG. 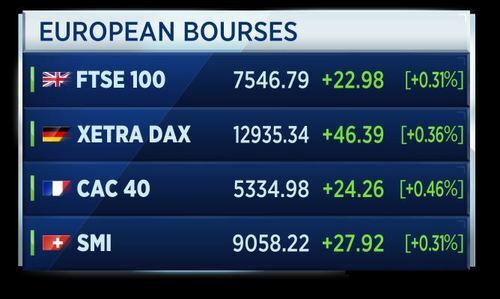 CNBCEuropean bourses are expected to open higher Tuesday, as investors turn their attention to stock news, data, and politics. 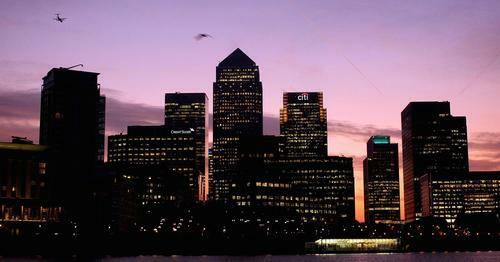 UK Serious Fraud Office says charges Barclays over 2008 Qatar fundraising. Four former Barclays executives - John Varley, Roger Jenkins, Thomas Kalaris and Richard Boath charged over 2008 fund raising. The SFO says defendants to appear before London's Westminster Magistrates' court on July 3. 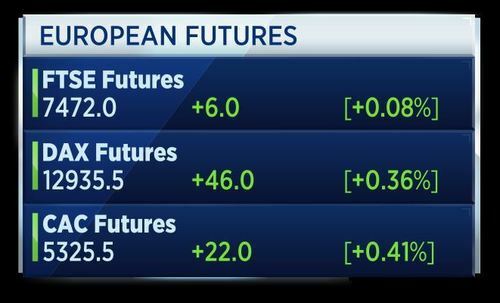 European futures pointing higher after the Nasdaq logs its best day of the year, while the Nikkei rallies to near 2-year highs, driven by tech stocks. The UK Serious Fraud Office charges Barclays over emergency fundraising from Qatari investors in 2008, after a five year investigation into the bank's dealings with the country at the height of the financial crisis. Barclays says is 'considering its position in relation to these developments' over SFO fraud charges and is waiting for further details of charges from SFO. 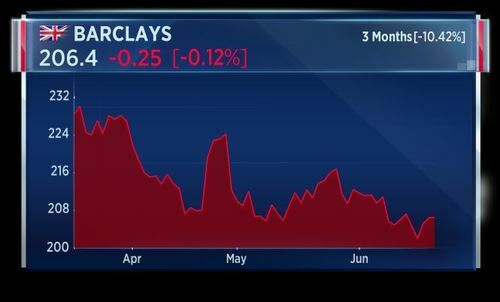 Barclays further adds that as previously disclosed, a civil claim has been served on Barclays Bank by PCP Capital Partners. That's according to Reuters. British Minister Grayling says I am confident we will secure a sensible deal with Northern Ireland#s DUP, talks going well. That's according to Reuters. British Prime Minister Theresa May's Conservative Party is confident of securing a "sensible" deal with the small Northern Irish Democratic Unionist Party (DUP), Transport Secretary Chris Grayling said on Tuesday. We're having good constructive discussions and I'm confident that we'll reach a sensible agreement, Grayling told BBC radio. "The talks are going on, they are going well. May lost her parliamentary majority in a snap election she called on June 8, and she will need the support of the DUP to pass laws. Grayling said the DUP were not interested in another election and added there should not be a change of prime minister amid questions over May's own position after the botched election campaign and her response to a deadly London tower block fire in which at least 79 people died. The UK Serious Fraud Office has charged Barclays over fundraising from Qatari investors in 2008. The office said it was charging 4 individuals in relation to the capital raising, including former chief executive John Varley. The investigation, which has taken five years, centred around undisclosed payments to investors in the country amidst a 12 billion pound emergency fund raising at the height of the financial crisis. In a statement, Barclays said it was considering its position over the fraud charges. Germany's IFO Institute has significantly increased its economic forecast for this year and next, seeing new record highs in employment. Growth outlook is going to be significantly better. We have seen a very strong first half year and stronger than we expected and this year we will also see a further increase in employment. Overall the euro has been undervalued for the German economy. 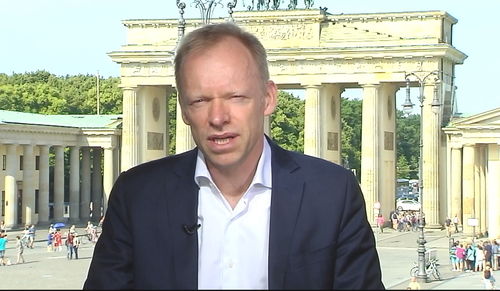 The revaluation will be a slight headwind but generally the euro exchange rate is too low for the German economy. UK Finance Minister Philip Hammond says government will prioritise British businesses and British jobs to secure the prosperity and living standards of the British people now and in the long term. Hammond says future trade deals must reflect Britain's service-based economy so that they deliver clear benefits to working people. He also said will remain committed to fiscal rules set out at autumn statement which will guide us, via interim targets in 2020, to a balanced budget buy the middle of the next decade. 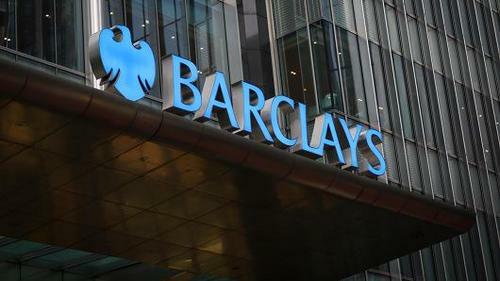 Barclays and four former senior executives have been criminally charged in a high-profile UK investigation into undisclosed payments to Qatari investors during a 12 billion pound ($15.4 billion) emergency fund raising in 2008. In a highly anticipated announcement, the Serious Fraud Office (SFO) said on Tuesday it was charging the bank with conspiracy to commit fraud by false representation and unlawful financial assistance. Barclays said it was considering its position over the charges and awaited further information. It also charged Barclays' former senior executives John Varley, Roger Jenkins, Thomas Kalaris and Richard Boath. The fundraising in 2008 included a $3 billion loan facility made to the wealthy Gulf state in November 2008, the SFO said. Now is not the time to raise interest rates, Bank of England Governor Mark Carney said on Tuesday, warning of weak wage growth and a likely hit to incomes as Britain prepares to leave the European Union. Carney, speaking to London's banking community alongside finance minister Philip Hammond a day after Brexit talks started, said that depending on how the talks progress, businesses might soon need to activate contingency plans. Before long, we will all begin to find out the extent to which Brexit is a gentle stroll along a smooth path to a land of cake and consumption, he said. Given the mixed signals on consumer spending and business investment, and given the still subdued domestic inflationary pressures, in particular anaemic wage growth, now is not yet the time to begin that adjustment, he said. In the coming months, I would like to see the extent to which weaker consumption growth is offset by other components of demand, whether wages begin to firm, and more generally, how the economy reacts to ... the reality of Brexit negotiations. 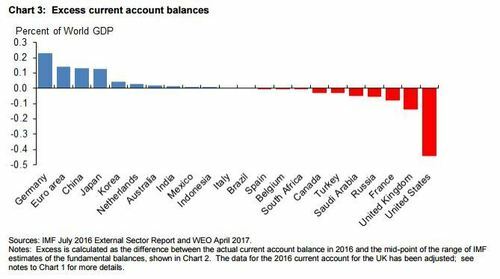 Carney also underlined the importance of trade liberalisation - especially in financial services - and said it was unclear if Britain's large current account deficit was yet on a sustainable footing. Here's the PDF version of Mark Carney's full speech at The Mansion House this morning. Moreover, despite the large depreciation around the referendum, the extent to which the UK’s deficit has moved closer to sustainability remains an open question, one whose answer depends crucially on the outcome of the Brexit negotiations. Most fundamentally, the UK relies on the kindness of strangers at a time when risks to trade, investment, and financial fragmentation have increased. Day one of negations between the U.K. and the European Union ended with Brussels getting its way on the timetable for Britain's exit from the economic bloc, leaving no illusions that London was not in control of its own destiny. CNBCCNBC interviewed 10 people working in the finance industry, from junior investment bankers to senior analysts to find out what's really on their mind about Brexit and how it will impact their lives and the wider City of London. The dollar hit a three-week high against a basket of currencies on Tuesday, after an influential Federal Reserve official said U.S. inflation would pick up as wages improved, bolstering bets on the Fed continuing to raise interest rates. The greenback got a further lift on Tuesday when Bank of England Governor Mark Carney said now was not the time to raise British interest rates, sending sterling down more than half a percent against the U.S. currency. CNBCEuropean bourses edged higher on Tuesday, as investors turned their attention to individual stock news and data. Germany's Merkel says danger of Brexit talks is that EU27 do not sufficiently deal with development of remaining EU members. She adds that she can think about a euro zone finance minister if the framework is right and if it helps tackle budget situation. 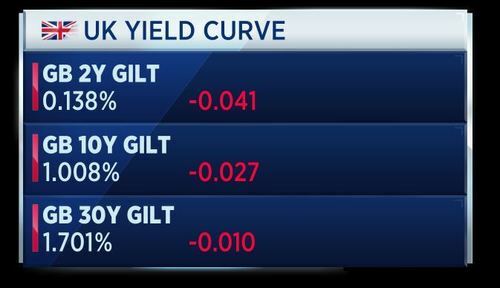 PIMCO's Bonds CIO Andrew Balls says Fed may raise rates as much as four times next year. He also says the probability of recession in U.S. over next three to five years is pretty high. That's according to Reuters. Spain's economy minister says some institutional investors in Banco Popular withdrew their deposits after ratings agency downgrades. That's according to Reuters. 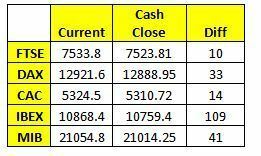 U.S. stock index futures pointed to a slightly higher open on Tuesday, as investors gear up for another batch of remarks from leading Federal Reserve officials. With little economic data due out on Tuesday, investors are likely to shift their attention to speeches by three leading Fed members, to see if they elaborate on the state of the U.S. economy, after the central bank recently chose to raise rates for the second time in 2017. 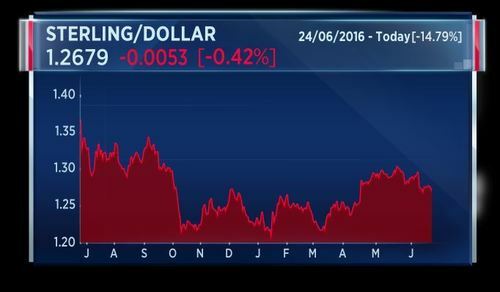 S&P's Kraemer says we have very little time for Brexit and the stakes are extremely high. 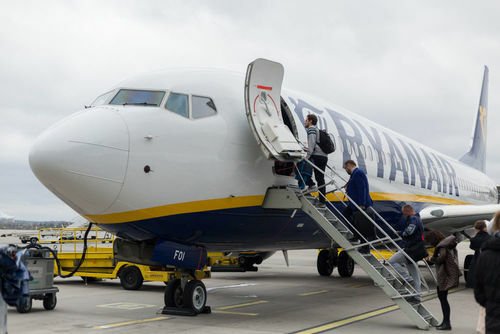 S&P Global Ratings's Managing Director, Moritz Kraemer has also said that the risks in Britain are much more tangible than in rest of Europe or U.S.
Ryanair announces it is buying another 10 Boeing 737 Max 200 aircraft. Five of these will be delivered in the first half of 2019, the rest in 2020. 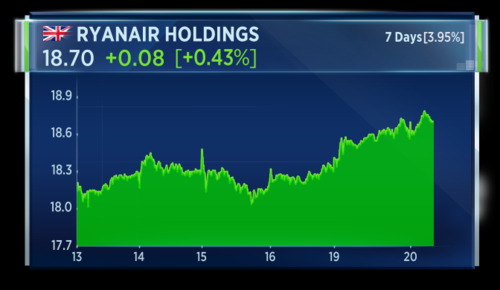 Ryaniar says the new order is valued at more than $1.1 billion at current list prices and will allow the airline to grow its traffic by 200 million customer per year by 2024. This brings the airliner's firm orders to 110, with 100 options outstanding. Ryanair shares are marginally higher today. 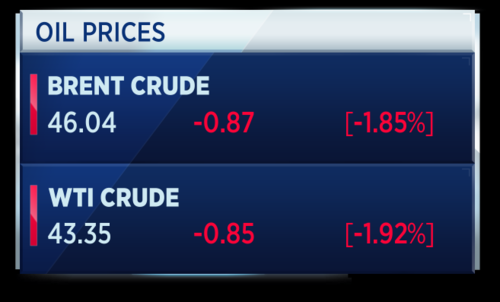 Oil prices are down sharply today, falling almost 2 percent. 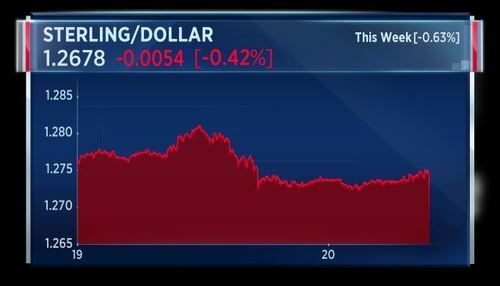 The price appears to be falling on concerns about rising supply production in the United States, Libya and Nigeria. North Sea Brent crude oil futures are down $1.06 to $45.85 a barrel, which is its lowest since mid-November.